Caring for a loved one with Alzheimer’s disease or other forms of dementia is a challenging and often overwhelming task. 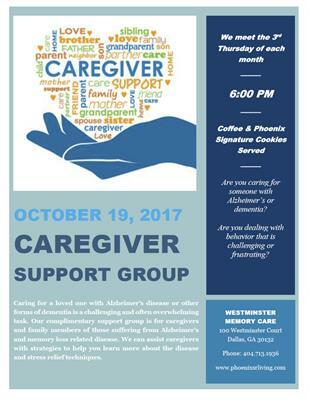 Our complimentary support group is for caregivers and family members of those suffering from Alzheimer’s and memory loss related disease. We can assist caregivers with strategies to help you learn more about the disease and stress relief techniques.? You are not on this journey alone.